Once you have selected the field of view you require, resolution and image quality are the most important lens selection criteria. The lens has to fit the resolution of the camera and the requirements of the application. With a perfect lens, all rays of light from a single point on an object plane will be focused to a single point on the image plane. Any lens behaviour that stops this happening is classified as aberration. Any physical defect on the surface of a lens will introduce image degradation, as the light reaching these defects will not focus correctly, as is shown below. White light is composed of many different colours or wavelengths of light. As white light enters a lens, each wavelength takes a slightly different path as the refraction varies depending of the wavelength of the light. This is known as dispersion. If a lens is not designed to take account of this dispersion, colour fringes will appear on any images taken. Accurate measurements will be impossible because the object's edges will be blurred. This blurring will increase towards the edges of the image. Where no colour information about the object is required, chromatic aberration can be avoided by using monochromatic (single colour) light. LED illumination is now the most commonly used type of illumination in vision applications, and is inherently monochromatic apart from white (see the illumination section). Currently the most commonly used and cheapest colour is red. If red light is used in conjunction with a matching red filter to remove any extraneous colours, the resulting image is far clearer and much sharper, compared to using white light. The extreme application of this colour correction can be found in the use of NIR (near infrared) corrected lens assemblies. These produce a sharp image in the NIR as well as in the visible area. This is ideal for all applications where ambient light is used in the day and an active NIR source is used to illuminate a night scene. The effect of chromatic aberration on images can be seen as a coloured fringe on the edges of objects as shown here. This makes accurate measurements problematic, as objects no longer have distinct edges. The vast majority of lenses are spherical. The surface of a spherical lens shares the same shape as a portion of a sphere. Lenses are manufactured with this shape because they are easier to grind. Although this shape is fine for many applications, it does not produce perfect images. The light passing through the centre of the lens will undergo a different magnification from light that passes through the edge of the lens. This means that each ray has a different focal point, dependent on its distance from the centre of the lens. Images produced from a spherical lens will be subject to increasing amounts of blur towards the edges. The use of aspherical lenses that have been shaped to maintain magnification across the lens will result in significantly improved images. All of these lens characteristics contribute to the overall resolution. This lens resolving power is specified as modulation transfer function or MTF for short. A lens is the first part of an imaging system and therefore needs to deliver decent image quality. But what makes a lens a “good lens”? What makes the difference in lens design and lens production? 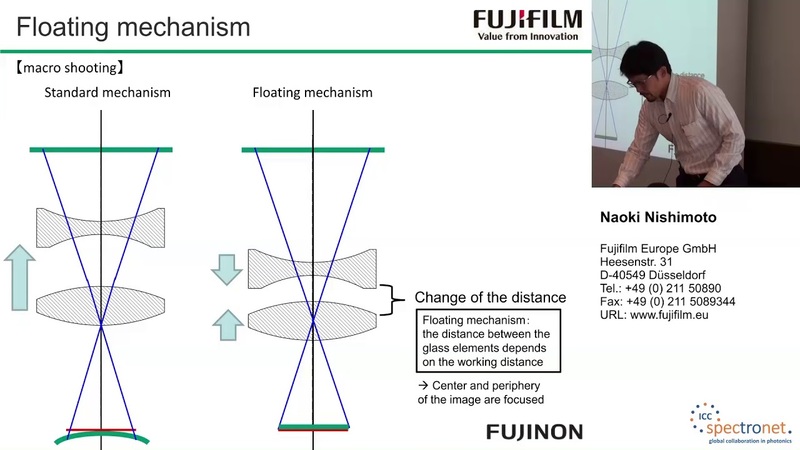 The presentation explains the challenges in optical design and how Fujinon lenses are optimized to deliver best image quality.